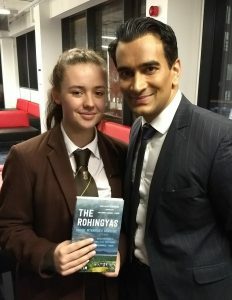 Senior pupils attended a lecture by Azeem Ibrahim on the plight of the Rohingyas people at Strathclyde Business School on 20th February. The event was organised by Asia Scotland who kindly provided entry to our pupils. Azeem who now lives in Chicago is a native of Glasgow and graduated from The University of Strathclyde. The 2018 edition of his book ‘The Rohingyas: Inside Mynamar’s Genocide’ has just been published.